I've had trouble deciding on tires for my past several motorcycles. My highest priorities are generally cost and tread life. For my KTM Adventure, I also need a good compromise of traction between dry and wet pavement, and off-road. Long wearing rear tires are much less common in the 50/50 (pavement/non-pavement) category, which makes decision making easier. Front tires tend to either wear like iron, but not provide much traction off-pavement, or work well on and off-road, but wear out very quickly. Most of this information is gathered from extended research online. I have highlighted the tires I've personally used, and will write a bit about them at the very bottom of this page. 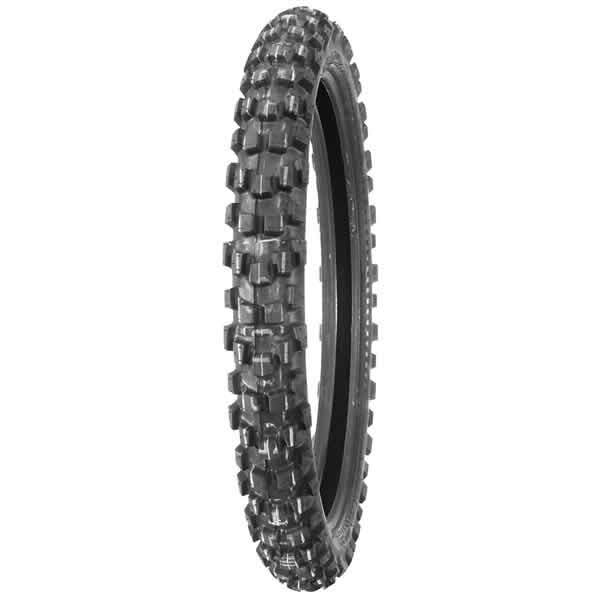 Generally regarded as the absolute longest lasting 50/50 rear tire. It is a bit more difficult to install, and has fairly poor wet pavement handling characteristics. I have run this tire! See Below For Info. The Mefo Super Explorer looks nearly identical to the Heidenau, and is rumored to be manufactured in the same facility. I have heard that treadwear is slightly lower, and pavement traction slightly higher, but have not tested these claims myself. Mitas tires are not readily available in the USA yet, although that is supposed to be changing. Right now you must purchase them through Canada. The tire cost is lower, which makes up for the extra shipping fees. The E-07's are supposedly an excellent tire, with nearly the tread life of the K60, and greater pavement handling. I have not tested these myself, but will most likely be purchasing one to try next. 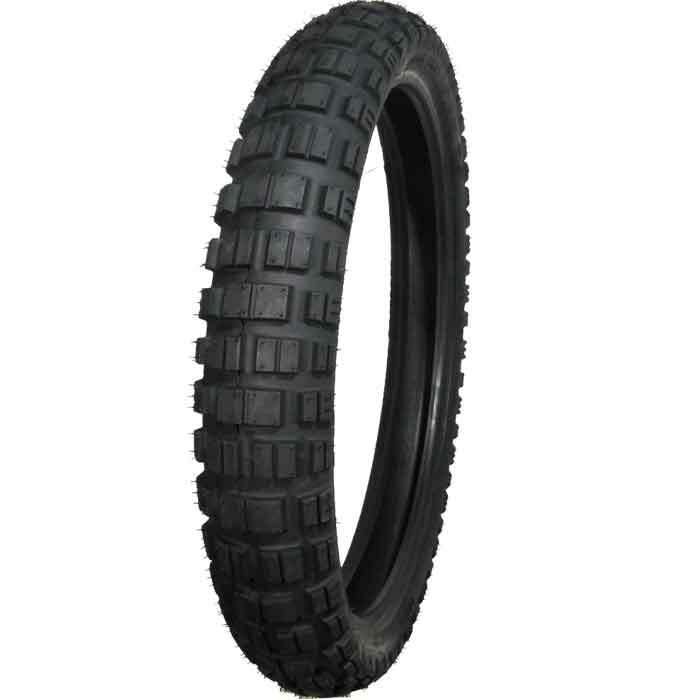 Continental TKC-80 - This popular adventure tire does well both on pavement and off, but generally only garners half the mileage of the aforementioned three. 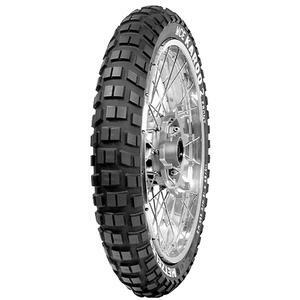 Dunlop D908RR - A very aggressive tire for mostly off-road use, this tire, in a 140 width, came stock on the KTM 990 Baja. Treadlife is expectedly lower. 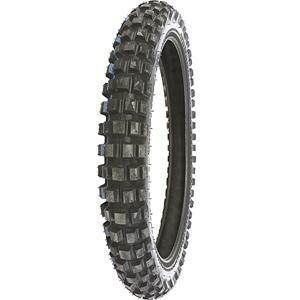 Metzler Karoo 3 - The Metzler attempt at the three tires above, reported great traction, but average tread life is still down, while the cost is comparable. Continental Trail Attack - A much mo﻿re street oriented tire, what this tire lacks in off-road ability, it makes up for in pavement traction and treadwear. Pirelli MT90 Scorpion - The OEM tire on most KTM Adventures, it does alright off-pavement and great on-pavement. I have run this tire! See Below For Info. Shinko 705 - My favorite 'low cost' rear tire. Under $110, and great on pavement, decent off-pavement, and acceptable treadwear, pretty easily 5k miles. Heidenau K60 Scout Front; Approximately $95 ea. RideonADV.com or Revzilla.com - I have run this tire! See Below For Info. The following are more aggressive front tires known to mate up well with a 50/50 rear tire. Most are DOT approved; a couple aren't true 90-90-21 size, but still work just fine on our wheels. Reportedly slightly better off-pavement than the other Pirelli, at the expense of tread life and road manners. Reportedly better on-pavement than the other Pirelli, and with much greater treadwear. This tire is closer to 50/50 than a true knobby, but it reportedly has soft sidewalls that can lead to bent/dented rims. It is still a very popular choice. The least expensive tire here, the few big bike reviews I have found sounded good, albeit reported short life. 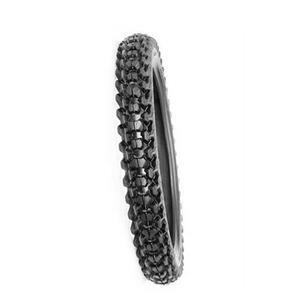 This tire has much smaller knobs than the TKC80, but is often reported to have better traction both on pavement and off, and similar tread life. 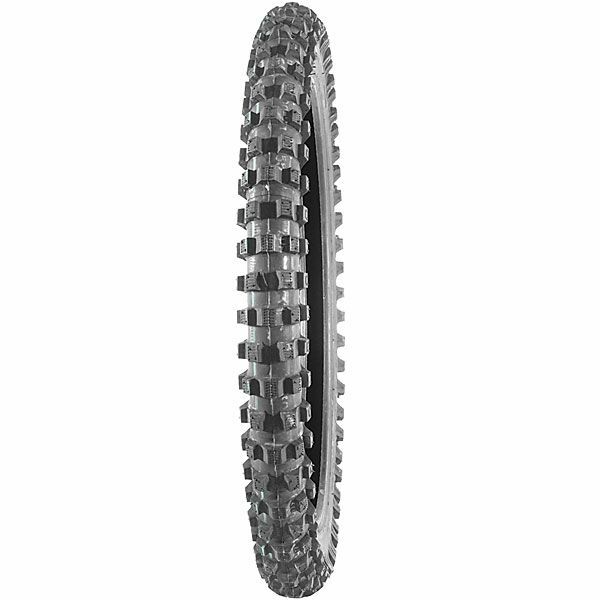 This tire is a popular 50/50 choice for smaller bikes, but on the big KTM the road manners aren't as solid as many other options here. 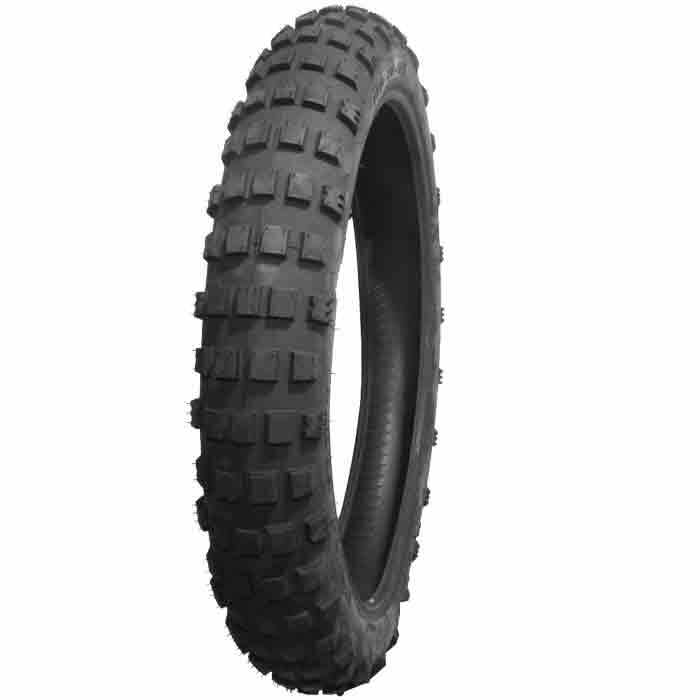 This is a very heavy duty and aggressive tire focusing on hard off-road riding. This is closer to a 50/50 tire, with much better road manners than the other Metzler, at the expense of some off-road traction. This is a heavy duty tire with good manners both off pavement and on, and is a very popular choice when mating up to a 50/50 rear. 3 Ply, but a little more dirt oriented than the other Mitas. 4 Ply, but a little more street oriented than the other Mitas. A smaller brand, but I've heard rave reviews from several sources. Contrary to my previous thinking, they are DOT approved. 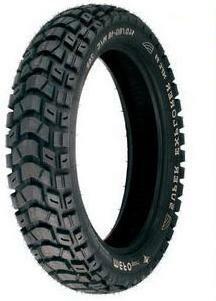 Pirelli MT90 Scorpion (Front and Rear): This tire does just fine on roads. It's great on pavement, and will handle gravel and (dry) dirt all day long. If you tend to travel off-road, (trails, mud, anything technical) you will find their limits quite quickly. 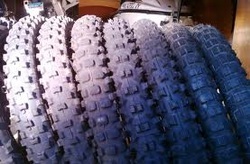 The price is right, and they do work well, but I wanted a bit more dirt-friendly tire, and I needed longer tread life. I wore through the rear tire in about 5,000 miles, while the front lasted twice that long. Heidenau K60 Scout (Front and Rear): A solid combination for almost all adventure riding. While a bit pricey, the extended tread life makes up for the extra cost. I used this setup on my Super Tenere and changed the rear at 12,000 miles, while the front only looked half gone. On the KTM, I have 8,000 miles on the rear, and it will easily last a few thousand more. The shortcomings with this setup are wet pavement (particularly cold wet pavement), and aggressive off road riding. They can run out of traction fairly quick, when pushing them hard in either of those situations. Michelin T63 Front and Heidenau K60 Scout Rear: In order to increase my ability to ride harder and faster off-pavement, I swapped the relatively sedate Heidenau K60 Scout front tire, for a more aggressive Michelin T63. The T63 will have a drastically shorter life, but cost less, and sticks better off-pavement. On road, traction is perfectly acceptable. At 4,000 miles the tire began noticeably cupping, and at 4,500 miles I rotated it on the rim (so it's spinning 'backwards'). I should have rotated it a thousand miles ago, but better late then never. I imagine I'll get another 1000-1500 miles of useful life out it. The tire worked perfectly well, I just wish it lasted a bit longer. I'd love to find a somewhat aggressive front that will last around 10,000 miles, as opposed to the T63 at only 5k, and the K60 at an unnecessary 20k. I will put the K60 front back on for the rest of the life of the K60 rear, but then I may try the TKC-80, one of the Mitas options, or even the IRC TR8 that I am trying on my WRR. Make your own decisions, double check your own sizes, ride your own ride, etc. Decide for yourself how important speed ratings, or DOT approvals, or specific tire sizes are, and buy the tires that best fit your wants and needs. This page is for tires that best fit my wants and needs, and I've made it public in the hopes of helping others like me. Not a single tire here is perfect; there are compromises with each and every one, and, each and every one has had a manufacturer defect here or there. I'm making no guarantees, I'm just trying to organize my thoughts in a way that may help others as well.